Double click a description to activate scroll. This is a cell shading example that employs old techniques, it was made for Game Maker 6, it should be rewritten with a shader. This is popular example demonstrating a parallax scrolling graphics technique used on old game consoles from the Sega Genesis and Nintendo Entertainment System era of video games. We already have the racing game up here, but this one is just the rendering, the original, by Martin Crownover. The source code has not been modified. I was bored and didn't feel like working on any of my projects for a few days so I made an isometric example. Also note all graphics, code, and other content is 100% my work. Use, abuse, and redistribute to your liking. Please don't credit me or anyone else, this example I made for public domain. It is platform game engine thing ok. Made by God knows who. Still works in GM. It worked right out of the box too. This is just an engine to build the game, so you need to add some objects to the room yourself to make a map to test on. This is a tutorial pack of over 60 tutorials including PDF documentation explaining 3D concepts, originally from the GMC about %60 worked directly out of the box, and the rest are working with a few slight changes. Heres a nice light cookie demonstration originally by Phantom107 over at the GMC. If anybody catches up with him, tell him I think he makes some pretty cool examples. This is a nice little 2d/3d vector conversion example I have refactored to make a little nicer, but it actually worked right out of the box to. It was by Phantom107 using Tepi's scripts from the GMC. Been looking for a smoothly-animated character in 3D for a loooong time, here I find one on the gmc, works right out of the box. This is the Box2D physics simulation I wrote while I was working on the function API. To test it out you must download, compile and install Box2D V2.2.1 and enable the extension in Build->Settings in the main menubar to Box2D. There are two versions, Studio Physics and Box2D, you wan't Box2D for this demo, the Studio version is just for compatibility with Game Maker. Documentation is available on the Wiki. This is the tool used for testing ENIGMA's capabilities on various hardware. To build it you must go to Enigma->Settings in the main toolbar of LGM and enable the OpenGL3 graphics system. You also must go to obj_gamestate's create event and change the two file paths for the shader scripts because ENIGMA does not yet have a proper working directory. This is the old Mark Overmars first person shooter tutorial from way back in the day. It works completely without flaw. This is an example for the curve functions. It shows how to use Bezier curves, splines and continuous curves/splines. It also shows a cool jellyfish like example which is heavily based on an example that was created by LSnK for his Curves extension for GM. A nice effects demo made by ThatGamesGuy on the gmc, the file still works in GM as well as ENIGMA. 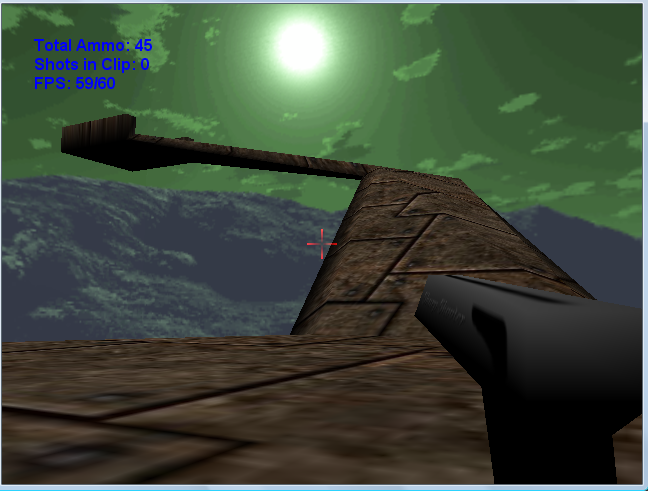 Little 3D storm example that was working in ENIGMA, originally created by Mesenberg (www.unrealgames.co.nr). Works on GM as well as ENIGMA. Destructible terrain example by Brett14. Compatible with GM still. This demo demonstrates both how terrain and models can be used along with Game Maker 6's new 3-D functionality. The terrain model is loaded from the file "level.3do" and feel free to change it. This example does not use fog in consideration for those who do not have a descent graphics chipset. Note: You cannot use the real-time rotation or scaling scripts with any models that are being used as terrain. However, you may use the standard ones which do not use Game Maker's transformation functions. ENIGMA - It's only incomplete because school makes Josh do homework. Blame the education system!